This year, for my birthday I have drawn a card of happiness, satisfaction, and fertility. 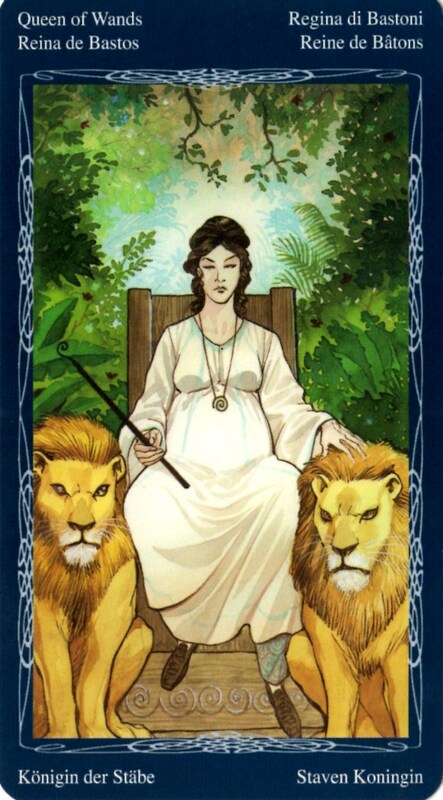 The Queen of Wands is a card that could signify a plan to accomplish a large amount of work in a small period of time, a balance of the shadow and the light parts of ourselves, or a helpful, supportive person in the querent’s life. Every year, when I draw a tarot card on my birthday (see previous years here) I am always surprised by the immediate insight I gain about the year to come. Meditating on my card for the year gives me intuitive guidance on how to make my upcoming choices, and positive expectation about what’s coming next. The rich symbolism of this card is girded by two of the four elements. The watery part of fire, the Queen of Wands is the emotional, nurturing aspect of the Fire element. She is a balance of opposites, but she is not at rest; there is a dissonance in her combination, and that creates (propels) forward motion. Affirmation: I am a radiant strong being filled with the power of love. 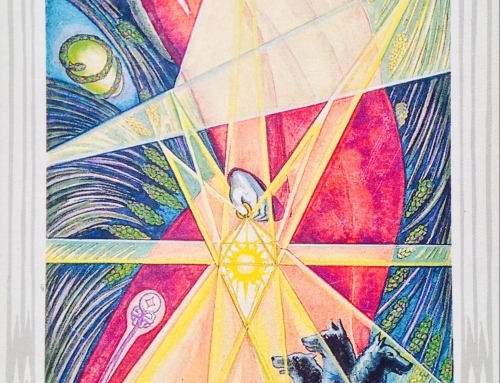 The 12 rays of light emanating from her crown represent the Zodiac, and the connection to spirit. 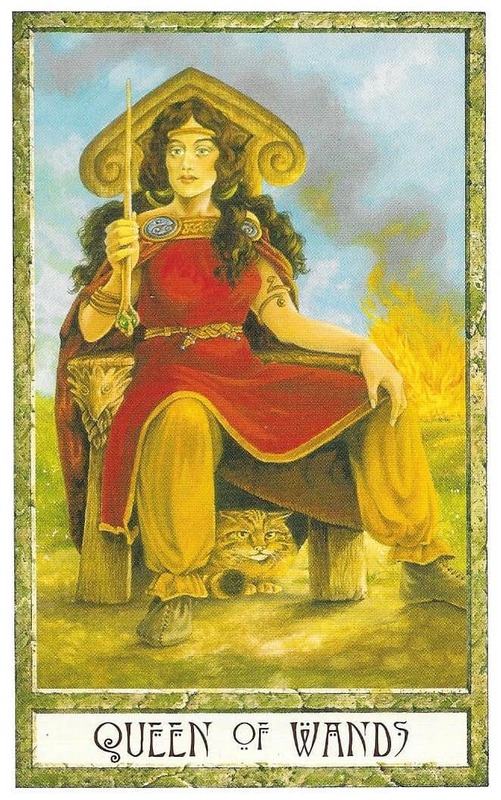 She is seated on a throne of fire, which represents her passion, ambition, and assertiveness. The flames beneath her burn steady, because she has attained self-mastery and control of her power. The thyrsus in her hand – the long staff topped with a pine cone – is a symbol of prosperity and fecundity, with which she can direct her will to create. 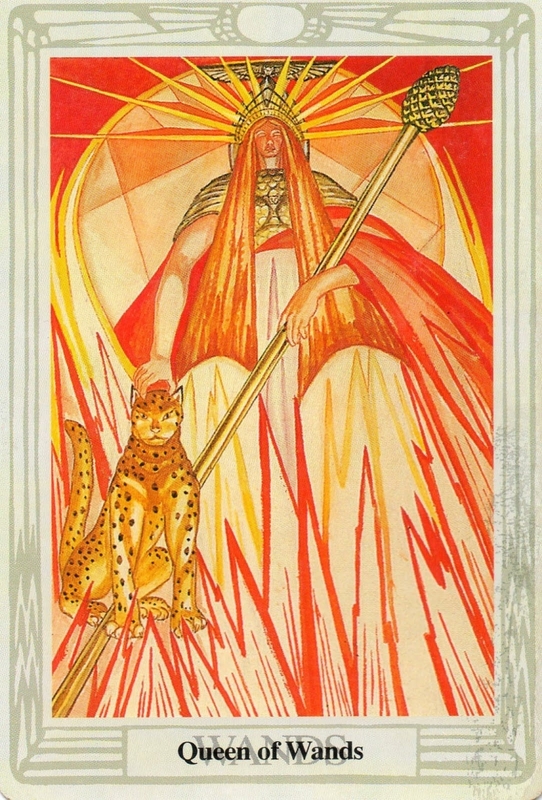 In reading up on the symbolism of this card, I have found great meaning in the leopard at her side. She represents a woman who, before she knew who she was, had black hair and walked with a panther by her side. She began to discover her nature through self-development, her hair turned brown and her panther turned into a leopard. When she fully realised who she was and expressed herself fully in the world, her hair turned red. The spots of the leopard remained as a reminder of the dark times she had experienced in her past. So the Queen of Wands represents the process of self discovery and awakening to who we really are, even though this means we have to experience possible dark periods in our life. Someone going through the process of self discovery and remembering how powerful they are. reclaiming their life. Has got to this point by resolving difficult issues in the past. She now a very strong character. A time to express your natural power and beauty and move on from the past. A strong independent leader focussed on her goals and knows what she wants. She leads a very active life. She has a lot of creative energy and creates a powerful first impression. Any one of these could be a method to interpret my year ahead; or, they could represent someone else. 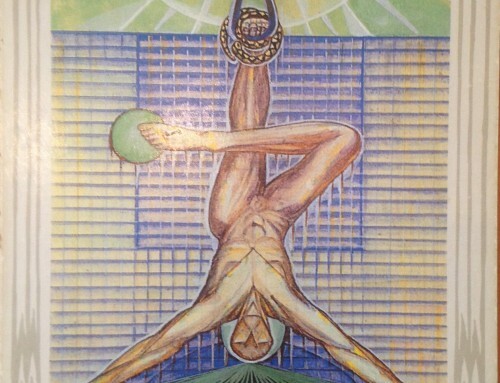 Oftentimes in tarot, one of the Court cards will represent another person in your life. 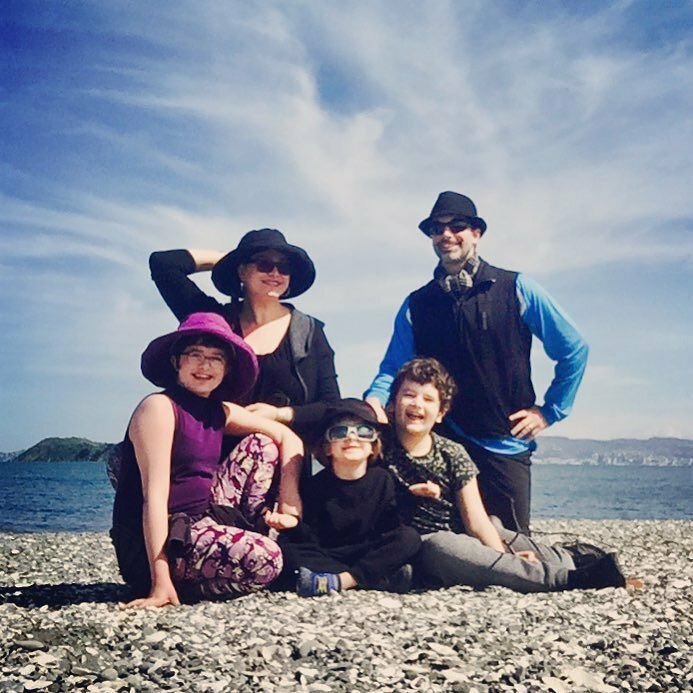 This year, on my very birthday, we have family moving to New Zealand to join us. My aunt and her daughter are arriving today, with many suitcases, to move and reside here in New Zealand now that they have visas and can stay in the country. My aunt is a powerhouse. She is also a Capricorn, a hard worker and practical visionary, and she has the ability to provide guidance, advice, and support in making things happen. I never would have been able to move to New Zealand without the assistance and inspiration of my aunt. She bought the house where we live, and for the first time in my life, I have a relative as a landlord. Her support and advice on many matters (including buying XRP) has given me a great feeling of safety and security. Having her here, building a house just on the other side of the forest valley from us, is very comforting. 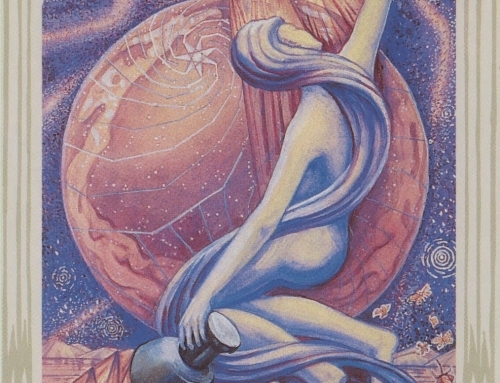 One possible interpretation is that the card represents a sincere, friendly, chaste, or loving woman who might become influential or is currently present in the querent’s life. 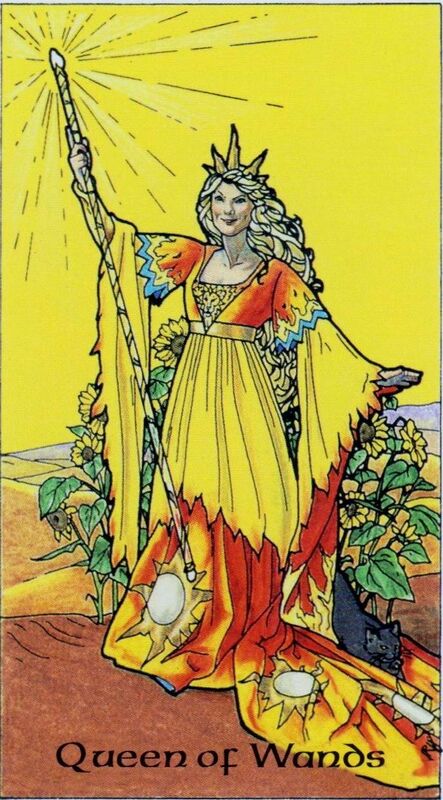 The Queen of Wands can indicate a woman who is very helpful and kind. She may stand for a woman in the querent’s life who is older than the querent, has hair on the lighter end of the spectrum, and who is considered to be a very supportive, giving person. She could represent a mother like figure. This year I’m looking into my shadows. I’ve hired the best intuitive life coach I’ve found, to help me work on my deep-seated financial issues. In every other area of my life – my health, my relationships, my environment, everything – I’ve been doing great. But my victories and gratitudes in these areas are continually being overshadowed by mundane financial issues, for long enough that I’ve decided to engage with this issue on an emotional level, and do the deep work in myself that can instigate deep change. My coach has given me homework and challenging exercises, such as reading the book above. I’ve always stayed away from shadow work, because I’ve got such deep shadows. One of the only practical methods i’ve found to keep my life on track, and keep my shadows from controlling me, is to stay focused on the light – learn how to think positively, practice the light work, and keep my chin up. This served me well, as I grew and matured, but now I need to go back and fix some old wounds, and that means uncovering them. The Queen of Wands encourages you to get to know your shadow self – the lesser-known and sometimes darker side of who you really are. This doesn’t necessarily have to be a negative aspect of yourself, but may be something that most people probably don’t know about you – yet! It may be your dark sense of humour, a secret life from your past, or a passion project that you’ve kept hidden away. While you may want to hide this part of yourself, the Queen of Wands encourages you to express this more openly with others – don’t be afraid to show your dark side every now and then. It will make you more real and authentic and will help you to connect on a deeper level with others. I’ve learned over the years, as I’ve helped other people manage their brands and tell their stories through my digital marketing agency, that the good stuff is near the bottom. The stories that stick, the ones that make an impact and facilitate connection, they are the deep, dark stories that are closest to our character. 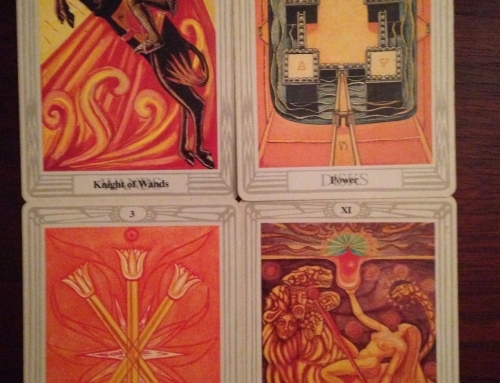 For years, I have hidden most of my stories, and now I feel like the Queen of Wands is inviting me to uncover them. I don’t show very many facets of myself publicly, despite how loud I am online. There are a number of fundamental portions of my character that I don’t share, and that’s kept me from maintaining, integrating, and accepting those parts of myself. These aspects of my character define me, quietly. They guard my greatest power, and my greatest wounds. I’ve always known that if I could share these portions of myself, I would be more authentic and more successful – but I’ve been scared, for all the typical reasons (and some abnormal reasons) and that has kept me superficial. This year I might try sharing some of these shadows, as I work my way through them. In the spirit of that metamorphosis, I will share something I uncovered this morning. On my birthday morning, I took a bath and listened to a root chakra guided meditation. I’ve been doing lots of work on my root chakra lately, as part of my natural healing to recover from stress-related symptoms that emerged last year. During this meditation, I was asked to visualize a golden tree, digging its roots into the ground, and imagine myself incorporating within it, my flesh turning to bark. There was a point in the meditation where the narrator offered a release of past karma, and to envision the layers of the past coming off. Recently uncovered by the shadow work I’ve been doing in Debbie Ford’s book is -> my guilt and shame over the life I lead. I’ve got a wonderful life, with a wonderful family, and deep down, I feel like I stole it. Every birthday, I am celebrated by people who love me, and every year I feel a little sad. The woman who gave me this gift, the one who gave birth to me, is someone I haven’t seen in more than twenty years. I’m not even sure if my mother is still alive. I could find out, if I wanted to, but I don’t want to. The only way I could accomodate the emptiness and loneliness of relinquishing my claim on my biological family is to stay far, far away and hide as someone else. I ran away permanently when I was 16 years old. To escape the physical and psychological abuse, when I was 19 I disappeared and changed my identity. There. I said it. I never say that, and now I’ve said it. This is the source of my spots, in the leopard on this card. This is the whetstone against which I sharpened my character. This is the wound that underpins everything I do. Part of me still feels guilty, for absconding with this life; for taking the gift of my mortality, and running away with it; for contradicting my mother’s edict that I was a criminal who would never succeed in my life, instead I took my life and made what I wanted with it. I’ve taken that gift from my mother, and I feel like I stole it. During my meditation today, I let go of that guilt and that shame. It’s only recently that I recognized I was holding onto it at all; but now that I’ve been able to see it, I can do things with it, and today I let it go. Today I claimed my right to have my life. Because that’s what I deserve, and that might be what’s been holding me back all this time. I haven’t felt like I deserve this wonderful, amazing, brilliant life I lead, and today, I claimed my right to it. That’s what the Queen of Wands would do.